According to /Film, Coca-Cola, which owns Hi-C, re-registered the trademark for the brand on September 15, and it was approved earlier this month. While this may simply be so that Coke can keep the name in its cold, sugary, clutches, it’s also possible that the soft drink maker is looking to relaunch Ecto Cooler alongside the July 17, 2016 release of Paul Feig’s Ghostbusters reboot. It would be a perfect time for grown men, pining for a time they were sucking down the neon-green beverage in the schoolyard, to mix Ecto Cooler with vodka while whining that women are totally playing Ghostbusters now, whether they like it or not. 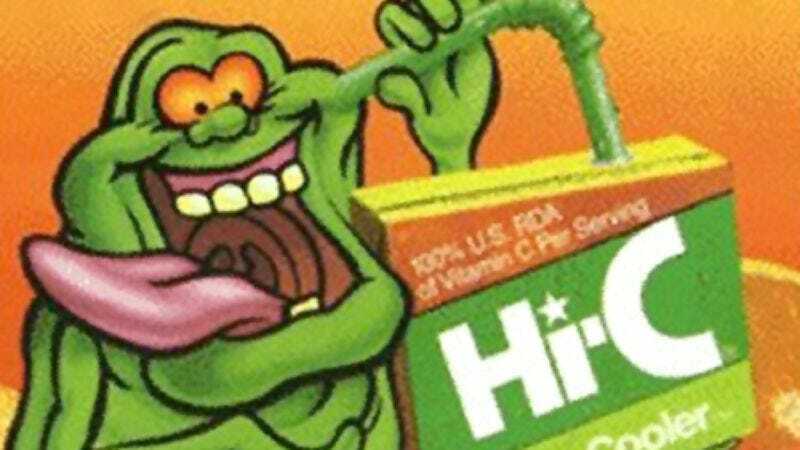 Ecto Cooler—arguably introduced in 1987, although this food blogger seems to sense a deviously crass marketing conspiracy was at play—was a citrus punch so popular that it remained on shelves and in lunch boxes long after The Real Ghostbusters was canceled in 1991 (1997’s Extreme Ghostbusters notwithstanding). The drink was re-named Shoutin’ Orange Tangereen in 2001, consequently replacing Slimer with a knockoff Rolling Stones logo before finally being discontinued in 2007. In 2011, Ectoheads came up with their own recipe that has been making the rounds on the internet ever since. In other words, Ecto Cooler has a following, so hopefully Coca-Cola doesn’t bring a New Coke-style debacle on itself by changing its formula. Servers at T.G.I. Fridays nationwide, having grown weary of vanilla root beer, grape, and orange, are reportedly cautiously optimistic that Ecto Cooler will be featured on the store’s Coke Freestyle machine come next summer.